Field Day Weekend. What is it? Why are all these people out in a field putting up antennas? 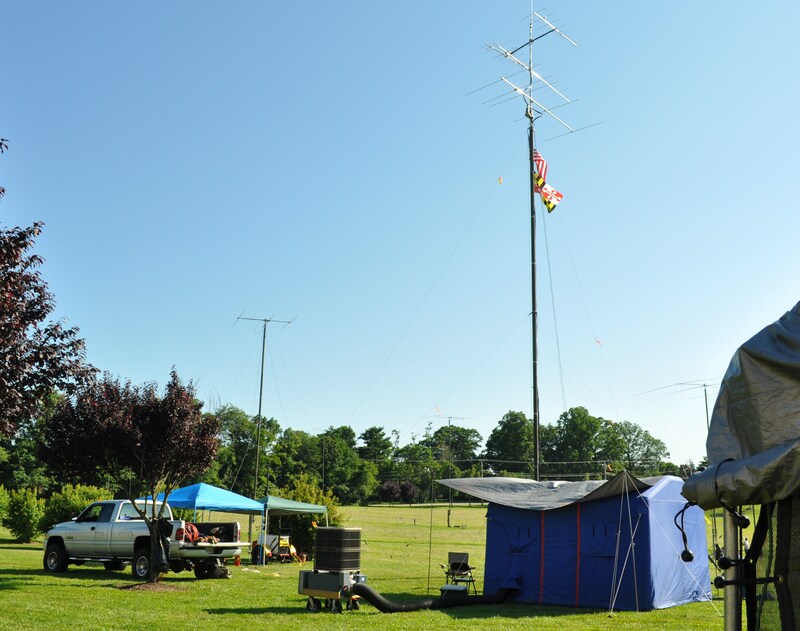 Two local Howard County based clubs join forces every year to put on an amateur radio extravaganza. Exhibiting a “Can Do” attitude with respect to creating and operating a major emergency communications capability. Think amateur radio isn’t necessary anymore? Ask those who need help after major disasters when cell towers are down, or inoperable due to damage, or overloaded. Ask after Katrina and other natural disasters. It is a good thing to have people capable of erecting temporary towers to assist local emergency teams. Once a year, the fourth weekend in June, clubs all across the United States participate in this exercise. 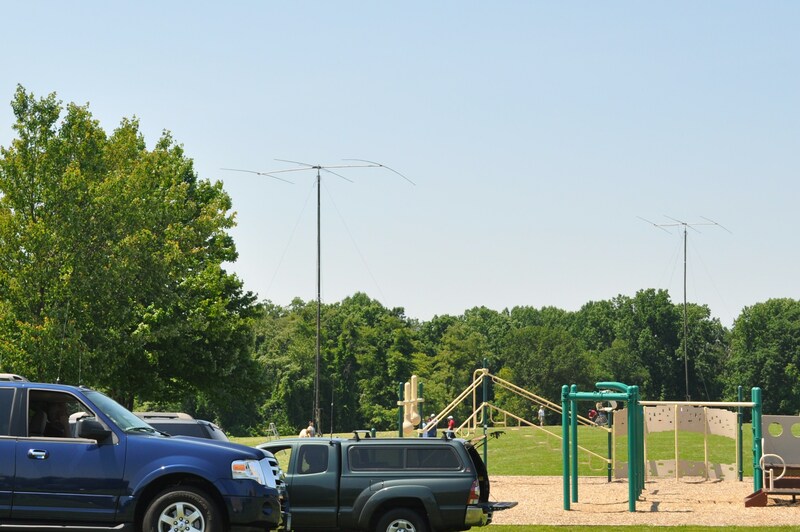 It allows club members to practice their skill at antenna erecting, generator based operating, and it builds a sense of community across the clubs and their respective local authorities. The clubs that put this effort together are the Columbia Amateur Radio Association (CARA) and the Potomac Valley Radio Club (PVRC). My husband is a member of both clubs. CARA focuses quite a bit on community service, supporting biking and running events and assisting at the Office of Emergency Management (OEM) during severe weather events. PVRC is a contest club, mainly. A group of very dedicated seriously competitive members spanning a few states with the center of the club radius here in central Maryland. Put the contesters and the community service supporters together and you get one huge effort to be the biggest and best station on the air this weekend. The clubs put up eleven crank up 50 foot high portable towers. String wire antennas between them as well as put up some monstrous beams to transmit on single frequency bands. Bring in generators, tents, and we will go on the air tomorrow at 2 pm, for 24 hours of seeking and contacting other clubs and individuals across all 50 states. You want the Taj Mahal of radio stations, how about an air conditioned tent? When you bring all the generators and most of the VHF/UHF gear, you can also bring your own A/C unit. As for the antennas out there, most of them come from one member. How about one huge 20 meter beam? 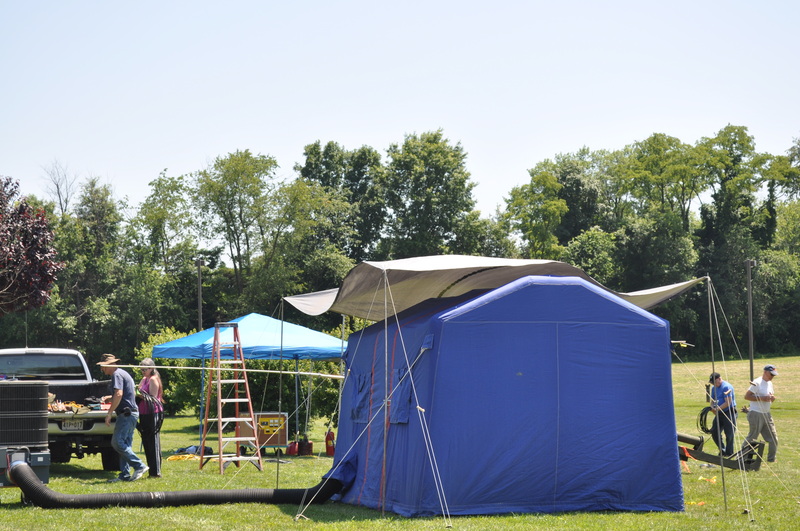 Besides the antennas, the club uses miles of coaxial cable to tie all these stations to their operating tent. All of the towers must exist within a set radius. The club is operating 28 Alpha this year. Twenty eight simultaneous stations on the air. Alpha means powered by generators. Twenty eight times hundreds of feet of cable. Twenty eight beams, dipoles, wires and other types of antennas at all frequencies available to the amateur community. We know they have finished set up of the towers when the flags are raised. Tomorrow morning is computer and radio set up morning, and all must be done for start at 2 PM. If you want to see something awesome, head out to Triadelphia Ridge Elementary School and visit. You can even operate one of the stations dedicated to getting new people on the air. Posted in Community, Howard County and tagged amateur radio, community, Howard County. Bookmark the permalink. Nicely written! I have taken to describing PVRC as a specialized club for guys interested in improving or maximizing their on-air operating skills and station-building know-how. Those are the main two items that go into it. “Contesting” is kind of a word without a lot of meaning to many. 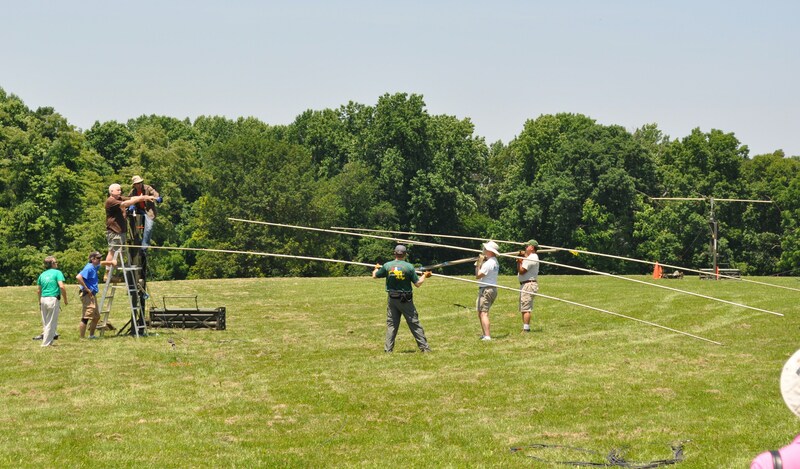 Yes, there are ham radio competitions and we enter those. But it’s all about building a very effective radio station and then knowing how to use it highly effectively.